I’ve been spending my 4th of July weekend with family in Sarasota, providing me a nice opportunity to visit new churches. This past Sunday, I went to mass at St. Patrick’s, which from what I could see appears to be a vibrant and relatively young community here. What I enjoy most about attending new churches is looking at the art: mosaics, stained glass, statuary, and so forth. 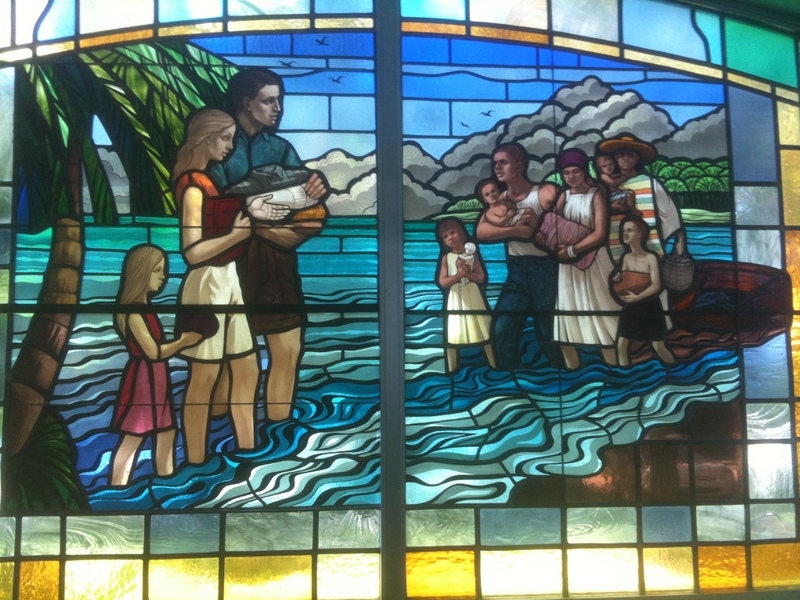 One thing I’ve noticed in a couple churches in Florida is that the scenes depicted usually have palm trees and beaches. While it’s possible they do this in the interests of fidelity to the tropical climate of the Holy Land, I suspect it’s also because these particular churches are situated among palm trees. Making the art look like something familiar can make it more accessible (similarly, I recommend checking out the diverse cultures represented in the side altars of the Basilica of the National Shrine of the Immaculate Conception in Washington, DC). 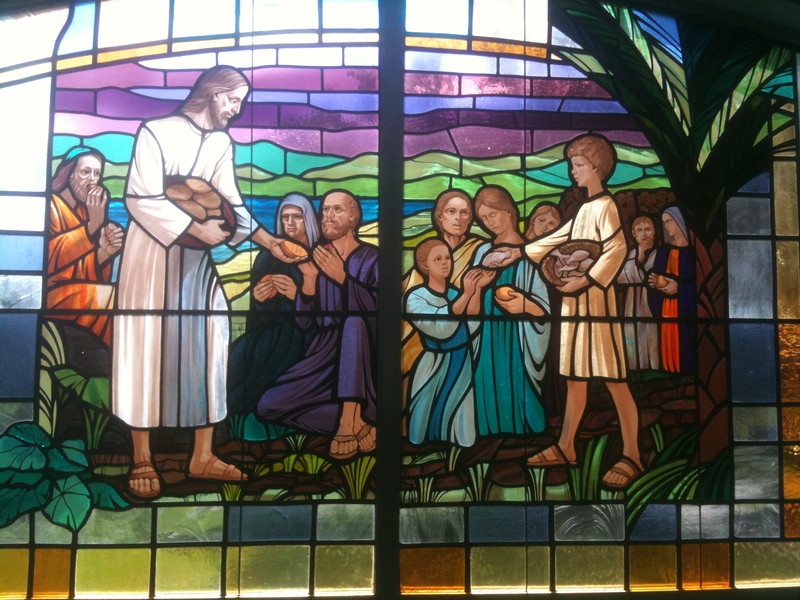 "Let the children come to me and do not stop them..."
"Jesus took the bread, gave thanks to God, and distributed it..."
In both pairs, we see the first panel depicts Jesus directly, first being with the children and second distributing the bread. These are images we are familiar with, not only from scripture itself, but from centuries of paintings, windows, songs, and (more recently) movies that adapt scripture. Most often, these artistic portrayals, even when the details thereof are more consonant with the socio-historical context in which they are created (as opposed to the original context of Jesus), are still explicit retellings of biblical stories. 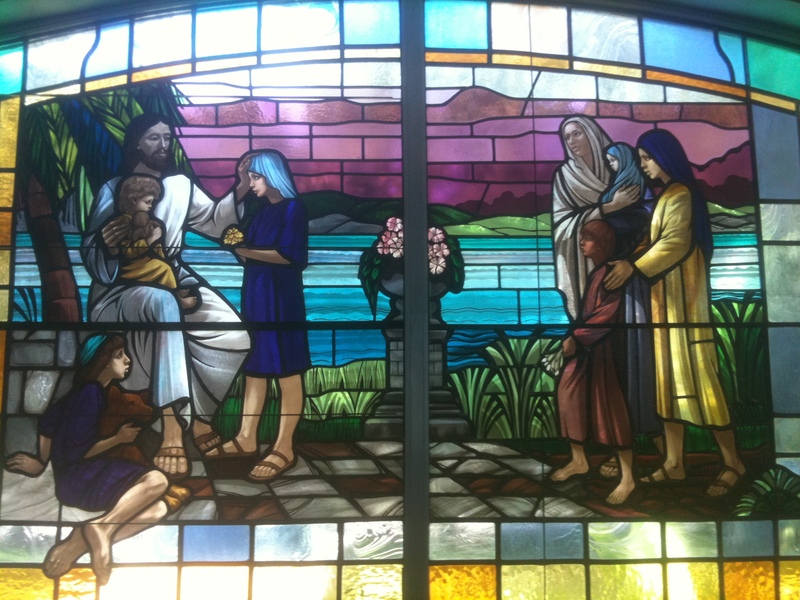 Yet in the second panel of each set of stained glass windows, we don’t explicitly see Jesus. Instead, we see Jesus implicitly, in the faces of those in whom we should see Christ. In conjunction with the first panels, these second panels depict the various people in them as Christ for us. In the first of the left-side panels, Jesus and the boy with five loaves and two fish are handing out food to the crowd. The scripture verse here is from the feeding of the five thousand: “Jesus took the bread, gave thanks to God, and distributed it…” This panel is paired with what looks like a picnic scene, possibly a potluck: there’s a reusable grocery bag or two, some benches, pitchers, a couple bowls, bread, and a big pot of something. There’s even a nice little puppy. The group seems to be there, together, as a small community, enjoying one another’s company. 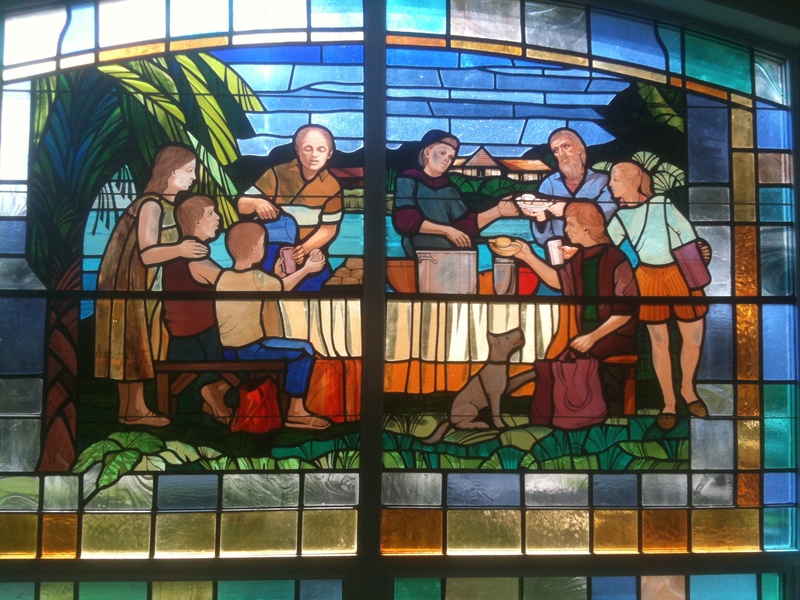 This panel is underlined by this segment of John 6:11: “and they all had as much as they wanted.” They are not merely eating food; they’re sharing a meal together as a community. I like these panels because they seem to be examples of faith seeking understanding in everyday life. Their meaning is only ascertainable in conjunction with their companion panel and the biblical verse that unites them. In its context, each panel tells a facet of the broader narrative, linking the image of Jesus with one view of how we might try to live like him. We see, in stained glass, a holy possibility. Steve, thanks so much for sharing these windows–I think they’re fascinating, and I particularly like that they seem to have some exegesis behind them. Rather than simply “updating” the story of Jesus and the children by putting them within a modern landscape, the window creator located the central message of the story about welcoming those who are among the least and most vulnerable, and found a way to depict that message in a modern context. William Spohn describes that as “catching the ryhme” between the gospels’ moral message and context and our own moral actions/needs and context. I find it’s an insightful and creative way to encounter scripture as a living revelation, and seeing it happen within art is great.